The FFAW, upstart union FISH-NL and Association of Seafood Producers will all make presentations on how many people should qualify as inshore harvesters. Two groups fighting to represent people in the province's fishing industry argued before the provincial labour relations board on Monday about who should qualify as a fish harvester, which will effect attempts to create a breakaway union. The Fish, Food and Allied Workers Union (FFAW) says the Federation of Independent Sea Harvesters (FISH-NL) is trying to strip collective bargaining rights from thousands of people in Newfoundland and Labrador with "absurd" tests to determine who counts as a harvester. In its closing argument, FISH-NL countered by saying those people wouldn't be excluded if they were actual fish harvesters. "It's a full time, commercial enterprise," said David Goodland, the lawyer representing FISH-NL. "People who are fishing recreationally on commercial boats — who have a fleeting interest in the fishery financially — aren't the ones who are meant to determine the fate and the future of the true inshore fishers in the province. It's that simple." Tom Johnson says "invented" tests by <a href="https://twitter.com/FISHNLUnion?ref_src=twsrc%5Etfw">@FISHNLUnion</a> to define who is an inshore harvesters are "contortionist" to exclude harvesters because they don't have enough cards to convince the labour board to order a vote. The hearing wrapped on Monday, but the board will not render a decision right away. Ryan Cleary, president of FISH-NL, had previously said that not everyone who pays dues has a serious connection to the industry. 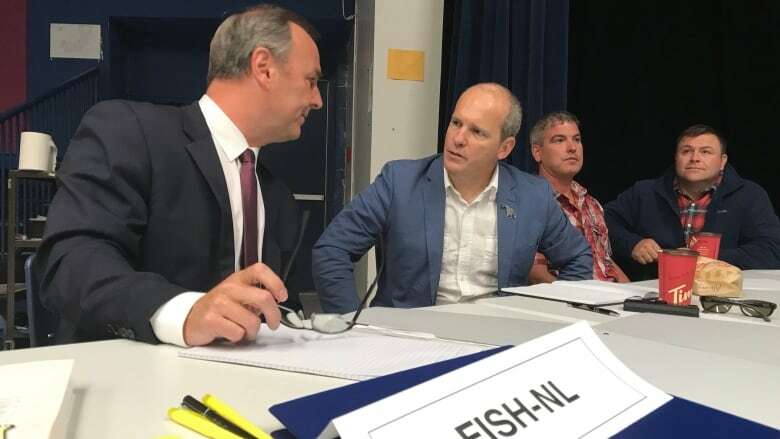 FISH-NL needs the support of at least 40 per cent — plus one — of inshore harvesters to force a certification vote. During the hearing, FISH-NL lawyer David Goodland said the FFAW's list of fish harvesters is "swollen" with names of people who should not be qualified to lend support one way or the other. An investigation by the labour board determined that just under 9,500 harvesters paid union dues to the FFAW in 2015 and 2016.
. <a href="https://twitter.com/FISHNLUnion?ref_src=twsrc%5Etfw">@FISHNLUnion</a> lawyer David Goodland says those who are not self-employed fish harvesters who make their living primarily from the industry should not have the right to have a say on which union represents them. FISH-NL believes that number should be closer to 4,500. If the list was limited to people who meet its standards of a fish harvester, FISH-NL would have enough support to trigger a vote on certification. Tom Johnson, lawyer for the FFAW, said their opponents created an arbitrary number of fish harvesters to bring before the labour board. "They counted their cards and saw, 'Boys we only have 2,300 cards.' So in order to come before the board they had to have a number that got them above 50 per cent," he said. "So they came in at 52 per cent. Our number is one that existed even before we knew what FISH-NL were planning." Johnson repeatedly used the word "absurd" to describe the qualifications FISH-NL wants to use to determine who is a harvester, and said some of them may contravene labour laws. Tom Johnson repeatedly using the word "absurd" to describe "tests" put forward by <a href="https://twitter.com/FISHNLUnion?ref_src=twsrc%5Etfw">@FISHNLUnion</a> to determine would be be eligible to take part in any future certification vote. One of those tests? Be age of majority. Johnson says some tests contrary to labour law. The Association of Seafood Producers also gave a presentation on Monday morning, and said it was not taking sides — adding the labour board has the authority to determine the criteria for an inshore harvester.